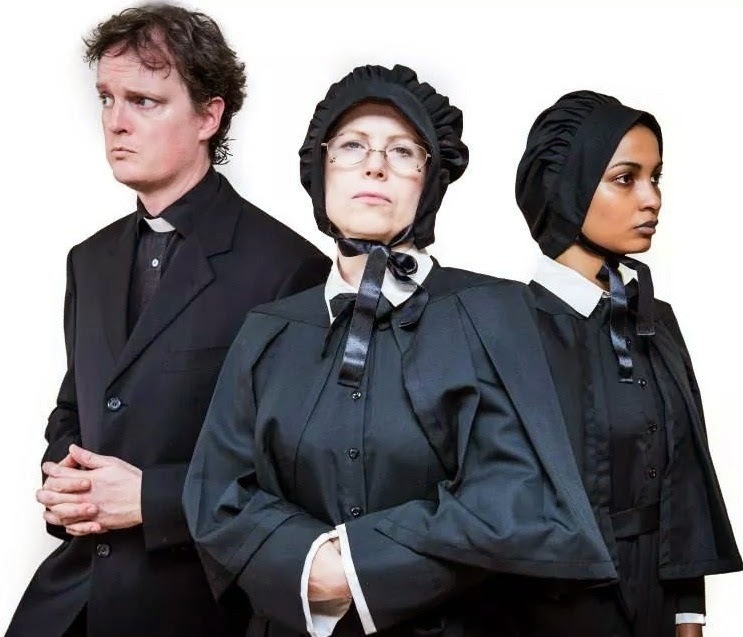 “Doubt - A Parable” is one of those plays that does very well in the classroom and at a dinner parties in generating lively and passionate debate. I wonder what the play wright, John Patrick Shanley, is getting at by referring to his play as a “parable”. Is he being a bit ironic (a parable being a fable) considering the recent unfortunate (to say the least) history of the Catholic Church in relation to its priesthood and young boys. Are there allegories in Doubt that allude to religious doubt? What is the symbolism in the play? What is the hidden subtext or rather subtexts - it gets a bit busy in this play. What are the characters hiding? What does the play say about the Catholic Church, education in the 1960’s, sexual repression, homosexuality, innocence, bitterness, and pedophilia and racism? Oh my goodness there is just so much juicy material to work with under a civilized layer of the bland life of institutionalized religious education. I could go on and on but you would be stuck here reading for hours about the play and we would never touch on the Backstage production. Brent Jenkins chose his play well. It is superbly written. The writer absolutely wants the audience to doubt. Every word that drips from that calculating pen is meant to leave you in doubt. The script is so very ingenious in this aspect of its presentation. I believe that Brent was true to the intention of John Shanley. Brent’s direction did not try and influence the audience. No mean feat. The slightest wrong footedness in direction would skewer the opinion of the audience and the work would become dishonest in its presentation. If you watched the play with absolute honestly and an open mind (that most wonderful of things) you could not, in good conscience, choose between innocence and guilt. You may have had a leaning in one or another direction. But make no mistake, that leaning will have been very much influenced by your personal life experience. 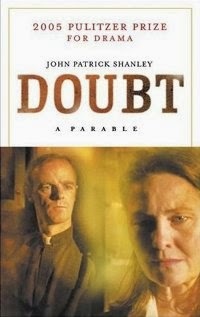 This is what John Patrick Shanley has to say about his work: “Doubt requires more courage than conviction does, and more energy; because conviction is a resting place and doubt is infinite – it is a passionate exercise. You may come out of my play uncertain. You may want to be sure. Look down on that feeling. We’ve got to learn to live with a full measure of uncertainty. There is no last word. That’s the silence under the chatter of our time.” We do all have an opinion though don’t we, at the end? This says a great deal more about us, as the audience, than it does about the play. As much as I thought that Brent Jenkins did an excellent job of not crossing the ever so tempting line of having his actors lean in one direction and influence the audience, I felt that the actors played their parts beautifully in this regard too. Mike Green as the accused priest Father Flynn rises, as always, to the occasion. He takes on the skin of our unfortunate protagonist with conviction. His interpretation of the role was well judged and convincing. We know he is hiding something but what? We get insights into his character from his soliloquies. In one moment you think “Ahhh I know which way this is heading.” but instead you get turned in another direction with subtlety - doubt building on doubt. His characterization is honest and complicated. We see him coaching the boys and warm to him and then we see his subtlety misogynistic attitude to Sister Aloysius and his defensive manner when confronted and we bristle with suspicion and antagonism. He is warm and caring with the boys and utterly unbending towards Sister Aloysius. The ridged unsympathetic character of Sister Aloysius was played well by Celia Cookson. 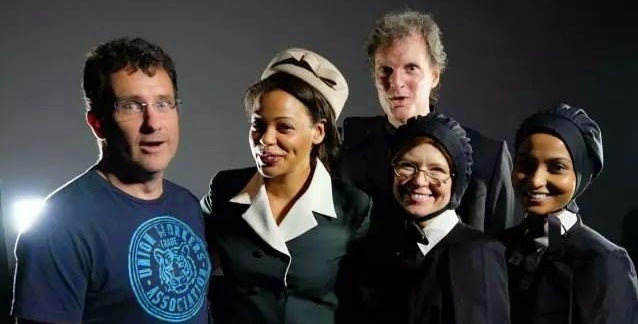 I loved the way Sister Aloysius and Father Flynn never made eye contact. A risky move as eye contact creates tension on stage. In this production the lack of eye contact created a distance that showed the characters distrust and extreme dislike for each other. There were flashes of bitterness in Celia’s performance that were lovely to watch. I would have liked to see a bit more light and shade in her character but again this may have been a risky move in terms of the overall need to keep doubt in the audiences mind. Celia’s voice lacked depth but her expression and fiddling hand movements made up for this. Sister Aloysius is not a warm person and yet the audience roots for her. You feel so dreadfully sorry for her. She is a women who genuinely cares for her charges but you get annoyed and bristle at her way of doing absolutely everything. Her ridged, set ways, and suspicions nature, stomping out light and warmth in her quest to do the right thing in every situation regardless of the consequences. She is the most dangerous of people - a zealot. My major criticism of the presentation of Sister Aloysius character is that at the end of the play when she herself expresses her own doubt I was not convinced. Not by her performance but by the lack of a building of it leading to that moment. Again this is a very risky bit to pull off without sacrificing the intention of the play. Ramya Bala played the young inexperienced Sister James. Ramya looks the part, all big eyes and youthfulness, displaying a quivery uncertainty. We see confusion from the get go but I did not see development from a simple, optimistic, young teacher to a teacher filled with doubt. The impression I got from Ramya’ s characterization was of fear rather than doubt and I would have liked Ramya to be a stronger voice in expressing doubt and giving voice to the audience’s conflict. There is an added twist in the plot when we meet Mrs. Muller, beautifully played by Mylene Gomera as the mother of the boy Father Flynn is accused of molesting. Her pragmatic attitude is shocking and tragic and utterly believable. Mylene give depth to the character of the mother and painted a heart aching portrait of the boy that we never meet, Donald Muller. Her role introduces yet another element of doubt into the production with a great big dilemma. Was Father Flynn giving a confidential supportive ear to a boy who would be ostracized not only for the colour of his skin but also for his sexual orientation or was he taking advantage of those factors to act out his nefarious selfish ends? 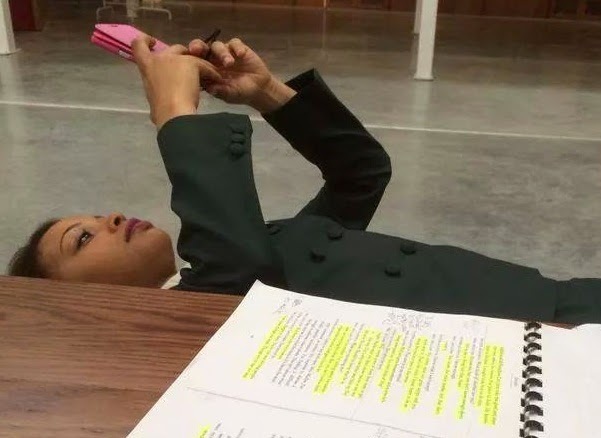 Hurry and and wait and learn your lines. Doubt could easily have been written as a two hander and been amazing to watch. By adding the two lesser roles the subject is given a voice and the plot a twist which makes us all the more doubtful. These characters also add depth to the social issues of the time. The 1960’s was a time were social reforms were sweeping across America. Attitudes were changing towards women’s rights, the black empowerment movement, ideas about doing things in the way that they had been accepted for generations were changing. All the fears that come with these events are woven into the story and seen by us, the audience, by the reactions to situations by the cast. Rather Flynn’s anger at Sister Aloysius for not following the protocols of Patriarchal hierarchy in resolving her conflict. Sister Aloysius distain for people who use a ball a point pen and her squashing of any fresh ideas out of Sister James are signs of fear of and resistance to change. The numbing attitude of Mrs. Muller who just wants her son to be able to grab the opportunity he has been given and get on with his life, fearing making any waves that might affect his ability to get further and fear of the reprisals of her husband against her son. It is a show laden with ideas. From a practical point of view the show was a great success. I loved the set and the use of space on the stage. The costumes were great and chosen with care and attention to detail was given in putting them together. The lighting, as always at this venue, is a bit problematic. I liked what was intended and having inspected where the lights were hanging and trying to figure out where else they could have been placed the crew did the very best that they could have done to get the effects they wanted. But I do have one complaint here. There were several ends of scenes where the fade outs were just too long. The audience needs to know that the end of the scene has come. Help them with this. Fade out quickly, don’t drag it out. I liked the choice of music used in the production but the music played for far too long before anything got going after the lights had faded down. There is nothing wrong with fading music with the lights. This must have been an exacting show to put together. You can never know for sure if you have achieved the purpose of the production until you have an audience. I think that Brent Jenkins and his cast pulled this off sensitively and elegantly. At the end of the show we (the audience) were asked to “vote” if we thought Father Flynn was guilty or innocent. I would love to know how the audiences voted.